Leaders learning coaching skills are often uncomfortable with conversations that involve emotions. It’s easy for results-oriented leaders to dismiss these conversations as a distraction from the real work of achieving results. They couldn’t be more wrong. Discussing emotions is essential for bottomline results. Lack of emotional self-awareness can be a fatal flaw in leaders. Emotions such as anger and frustration aren’t necessarily the true story of what a person is experiencing. For example, at a department meeting a manager listening to a report makes a couple of rude comments to knock his colleague down a peg or two. You have a talk with the manager and let him know that kind of rude behavior isn’t acceptable. He apologizes to you and his colleague. But it happens again, in a slightly different form, a few days later. Although you confronted the behavior, the manager is most likely unaware of what was happening inside him that resulted in his rude comments. Perhaps the manager felt competitive because his own team’s results don’t look as good in comparison. Or maybe he felt inadequate in his own leadership, resents that feeling, and jumps to fear that he may be discovered and lose his position. All these leaps of emotional “logic” happen in a split second and could result in fear, followed by his fight response. If this behavior continues the manager is likely to be removed, not for what he was afraid of, but because of his lack of awareness of his own emotions and his resulting behavior. Lack of emotional self-awareness can be a fatal flaw in leaders. Had the manager been more self-aware of his emotions he could have understood where his fear came from, evaluated it, and chosen to respond differently. Here’s where a coaching conversation that includes emotions would be helpful. You: Bob, what was up with your rude comments to Becky in there? Bob: Yeah, sorry, having a bad day. You: That behavior is unprofessional and isn’t acceptable. Please apologize to Becky. Bob: I will. Won’t happen again. You: Actually, it’s happened a few times the past couple weeks. What was going on inside of you when Becky was speaking? Bob: I was ticked off. Bob: About how she gets the spotlight, extra resources, and we’re scraping by because our team isn’t working on the latest new thing. You: So, you’re feeling angry and resentful of Becky, and how you believe you and your team are being treated? Bob: Well, that sounds worse than it is, but yeah. You: What are you afraid of here? Bob: Well, to be honest, I’m afraid that I’ve being sidelined in my current role. While people like Becky are moving forward. You: And this fear resulted in your comments in the meeting? Bob: I guess. It sounds pretty childish saying it though. You: Maybe [smiling]. When we’re afraid and not fully aware of it we have an unconscious fight or flight response. Now that you’re aware of your underlying emotions, you can choose your response. You can even choose to continue feeling this way or not. Bob: Well, what I’m doing now isn’t working. I mean, the fact that we even need to have this conversation is embarrassing. You: Let me tell you, the more leaders grow – and you’re a leader Bob – the more we have to look inward for our growth. Self-awareness, beginning with what triggers our emotions and the actions that result, is core to a leader’s development. With self-awareness you’ll be able to understand why you react as you do and make the necessary changes. Bob: I appreciate that. Sorry again for my behavior today. The more leaders grow, the more they have to turn to the internal for their growth. Confront the behavior. Behavior is the result, not the cause of what’s going on. Use the behavior as a way to initiate exploring what’s happening internally for the person. Ask about what was happening inside the person. You’ll often get a shallow response. Like, “I’m having a bad day.” Or high-level emotions like, “I was angry.” You’ve got to go deeper. Ask about what triggered that internal response. Here’s where you may get to the root emotions. For Bob, it was fear of being side-lined in his career. So, he felt threatened by the attention Becky received. Examine the emotion. Discuss how appropriate that emotion is. Is it based on facts? What else is true about the situation? Ask how helpful this emotion is: How is this emotion serving you? Create new options. Ask: What do you want to do with this emotion? How do you want to respond when this emotion is triggered in the future? Your own emotional self-awareness is critical to being able to help others with theirs. You can work through these same questions on your own, or better, with a coach. 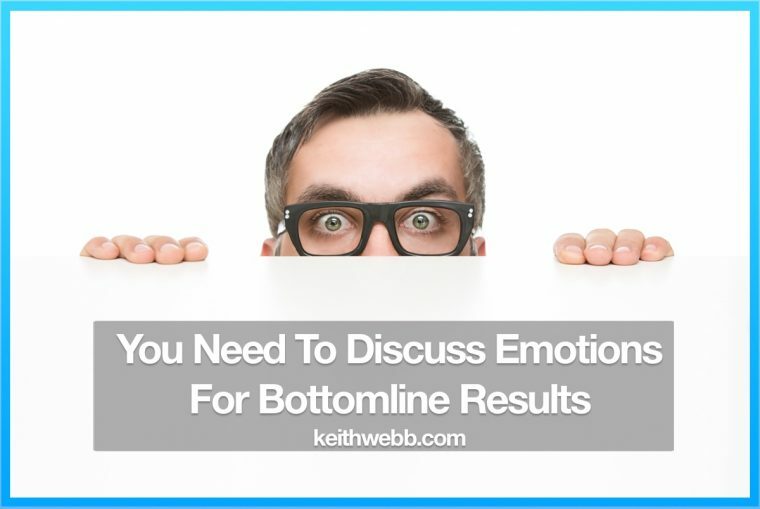 If you want bottomline results, you need to be willing to discuss emotions.